Over 600 metalworkers gathered in front of Iranian ministry of labour and social security as negotiations with government officials regarding their demands reached an impasse. ILNA reports that on Saturday over 600 workers gathered to protest against deferred payment of their wages and benefits. Valiollah Movahed the workers' representative told reporters that over five months of the workers' wages have not been paid so far. Another worker rep, Parvin Mohammadi reported that in the last gathering of the workers, the owners of the factory managed to end the protests by providing a cheque covering the workers delayed wages. Mohammadi said however that the cheque was not cashed and workers' demands remained unresolved. Saturday's protests continued through midday and when they demanded to see the minister, they were reportedly informed that the minister had travelled to Mashhad and further negotiations with ministry officials did not result in any resolutions. 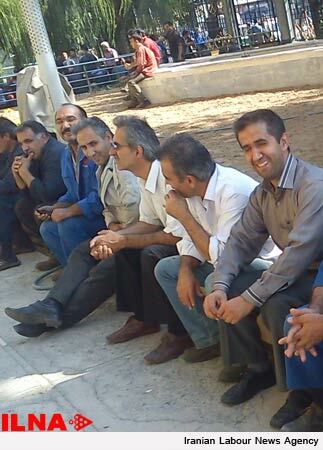 Worker protests have been on the rise in Iran as many businesses are failing to pay worker wages in a timely manner. 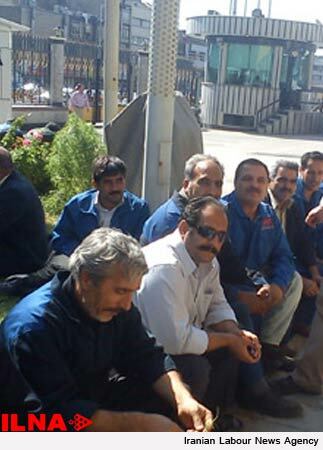 Last Tuesday, Tehran Vahed Public Transportation company drivers also joined protests against wage discrimination in their workplace. Mahmoud Ahmadinejad has been blaming the growing economic woes on the increased international sanctions against Iran, but the opposition maintains that the administration's inadequate economic policies are at the heart of the increasing economic difficulties faced by the people.